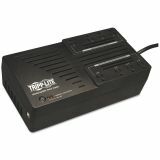 Tripp Lite AVR Series Ultra-Compact Line-Interactive UPS, USB, 8 Outlets, 550 VA, 420 J - AVR (automatic voltage regulation) Series Line-Interactive UPS System offers line-interactive protection for PCs, workstations and other sensitive electronics in an ultra-compact, mountable housing. Maintains 120V nominal output over an input range of 83V to 147V. Workstation-optimized features include USB port (HID-PDC compliant), single-line TEL/DSL surge suppression, battery-protected and surge-protected outlets and surge-only outlets. Input: NEMA 5-15P (120V 15A)/Output: 8 NEMA 5-15R (120V).